Originally published in 1951 and anthologized in Nobody Asked Me, But ...: The World of Jimmy Cannon. Dec. 31—Nothing will help you. You'll get drunk and regret it with a belligerent pride. You'll go for more money than you should. You'll tip the captain of waiters a day's pay to sit down close to the floor show which you'll never see because they'll have you out in the men's room putting ice on your forehead when it goes on. You'll tell the guys down at the shop about the hole the blonde's cigarette burned in your tux. You'll swear you'll never do it again. It's a pledge you'll fracture in a year. You'll bet you left your ring and wrist watch on the sink in the gents' place. Your wife will contradict you and insist the cab driver rolled you when he lifted you out of the taxi. You'll wear your eye black with the dashing pride of a company clerk showing off his Good Conduct Medal on the first furlough. You'll be sick to your stomach. On Saturday morning you'll telephone your friends and describe your misconduct on the hazy night before and they'll recite what they did. It will all sound like what happens in a hog pen at the end of a famine but it will make you proud when you relate it. It will please your wife that while you were hugging the hat-check girl the doorman leered at her with what she will confuse with desire as long as she lives. All of you know this before you start out tonight on our country's biggest and ugliest drunk. It will happen in farmhouses, cold-water flats, in mansions and in tenements, in apartments of all types, in houses in the countryside, in villages and in cities great and small. There will be parties in furnished rooms, in offices, in lodge halls rented for the occasion, in public places which include lunch carts and hotels. There will be the commotion of frivolity in bars and grills, restaurants, night and country clubs, down in basements with a keg of beer tapped badly, and humid. The solvent will do it right and the bums will mooch the price of a demijohn of wine and sleep it off in doorways. It is done unwillingly in many instances. The reason for it is economic. On all plateaus of our society being sober on New Year's Eve lowers a man's prestige. The guy who can't go to the office Monday morning and brag that he violated every dogma of indoor protocol will be considered obsolete and used-up. The junior clerks will identify this as a flaw and start scheming to grab his job before he is put on the pension and given the wrist watch for years of meritorious service. New Year's Eve is the time when people are deliberately rude. Normal politeness is rejected as eccentricity. I am a guy who gave up drinking for various reasons, including many defeats by guys a sick chorus girl could trim. I suffer most from sobriety on this night of mass boozing. I find myself to be the representative of conservatism at all functions pitched on this clamorous midnight. People treat me as though I were a spy among them who was there to witness their calculated gracelessness. The most proper of my acquaintances have prepared for this night with a reluctant cunning. They protest they dread the torture of making spectacles of themselves. But they understand a man must get obnoxiously loaded on New Year's Eve if he intends to stay socially acceptable for the next twelve months. They cry they are being fleeced in the inns and cabarets. But they feel it is their duty to go broke getting drunk even when they have no affinity for alcohol. It is not only the amateurs and the semi-pros who do this but the real rummies. The rummies stand against bars and control the wild impulses which whiskey instigates in most men. They preserve their dignity while under the influence of liquor every day of the year but tonight. Occasionally they knock themselves helpless with Martinis because this is the most ferocious drink ever made by man. They go limp and their old ladies come down to the corner saloon and sweep them up like trash. On ordinary days such pass-outs shame them. They frequently go a whole hour without taking a peck at the bottle they conceal in their desk. They create alibis for these collapses and it seldom has to do with the drinking of whiskey. It is usually blamed on lack of food or an inept bartender who polluted their Martinis with the wrong brand. On this night the saloon manners of the whole country change. Every one believes propriety is a weakness and succumbs as rapidly as he can to surliness, insensibility or the romancing of women. Guys who can drain a quart of brandy without changing their position at the bar once have been known to put on paper hats after a tumbler full of champagne on New Year's Eve. They throw confetti and wish people they despise a happy New Year. They roll around in the sawdust. They make passes at their best friend's wife even when the lady doesn't appeal to them. On New Year's Eve all those who drink act like demented children and a reveler is believed to be a failure at frivolity if he doesn't insult all those who come in contact with him. But on this night it is the good drinkers I pity. The rummies suffer most. Jimmy Cannon was a legendary and oft-imitated New York City newspaperman. In his cranky emeritus years he was a fixed point against which a younger generation of sportswriters oriented themselves, but in his heyday, particularly on the subject of boxing, he was often the best thing going. 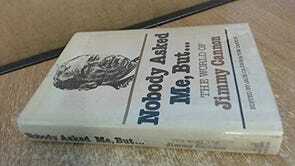 For more, check out his anthology, Nobody Asked Me, But ...: The World of Jimmy Cannon. 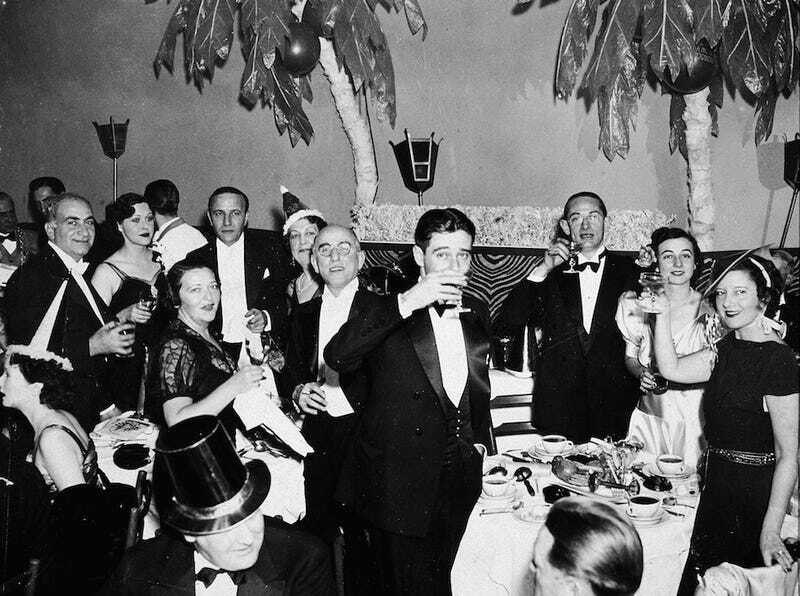 Photo of New Year's Eve revelers at New York City's El Morroco night club, circa 1935, via Hulton Archive/Getty Images.